Brenda Swenson: Watercolor Workshop in Southern France! 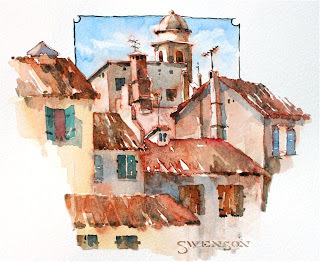 Watercolor Workshop in Southern France! 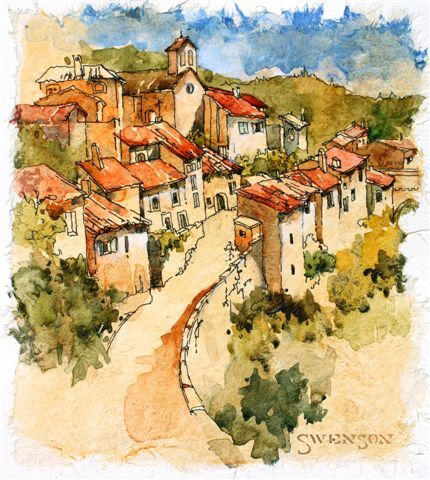 Would you like to join me in Southern France? Enjoy daily sketching and painting adventures, culture, food, wine…and people of the Languedoc region while staying in the historic Montfaucon residence, the recently remodeled 800-year-old medieval building on the river Aude in downtown Limoux. The dates are June 23rd to Saturday July 7th, 2012. I encourage a build-up of sketches and painting ideas – not sitting all day in one spot. I move you along frequently, partially to show you lots of lovely locations, but also to stop you from overworking an image. Travel workshops are not as intensive as studio workshop courses. You are on vacation too, and it is important to relax, enjoy and see something of the country you are visiting, therefore painting sessions are daily, but always optional. You will have opportunity to paint as much or as little as you like. Our painting sessions are generally more structured in the mornings, with demonstrations, then time for you to sketch/paint, while I work with you, helping individually. Afternoons can be more relaxed. Every few days, I suggest a critique, to see what each other has been producing, ask advice and exchange techniques and ideas.I encourage all levels of ability and confidently teach complete beginners to professional artists – this way you can learn from each other, which creates a great stimulus for everyone. Each morning after breakfast we will either set out to our painting destination or stay at Montfaucon or in Limoux for lessons and or studio work. We incorporate sight-seeing opportunities and historic sites into our daily outings whenever possible. In the evening there will be time to relax before we have dinner. Each Wednesday you will have the day free to do what you wish. There will not be transportation provided on that day and you will be on your own for the evening meal. We are happy to provide you with suggestions for things to do on your free day or if you would just like to relax around Montfaucon you are welcome to do so. The weather in June and July is usually very pleasant and warm. However, Limoux is situated in a micro-climate between the Mediterranean Sea and the Pyrenees, which can cause the weather to change very quickly. It is advisable to dress in layers and don’t forget your bathing suit for a visit to the seaside. Also make sure to bring a few nice outfits for dinner. * Pick up and delivery from Toulouse airport or Carcassone train station. * Accomidations-All rooms are double occupancy. The rooms are very spacious with two separate beds for individuals and large king size beds for couples. *14 breakfasts. The breakfasts are served at the hotel/residence. *12 dinners. We have 3-5 dinners at Montfaucon, prepared by our chef, and the balance of the dinners at restaurants in the region. We will try to accommodate special diets if given sufficient notice. *Overnight stay in the seaside village of Collioure. *Anytime use of our professionally designed art studio, campstools and chairs for painting outside, easels, painting tables, water containers and bottles. *Guide with knowledge and history of the area. *Daily transportation to all of our painting sites, except Wednesdays. *Admission to historic and cultural sites. Brenda, It sounds divine!!! If I didn't need to make my springtime pilgrimage to France & Poland this year, I would love to join you all! Some of the highpoints of my whole life were on my trips to Provence, so for anyone who is even considering this, I say "Go for it!!" It is soooo worth it, & having Brenda for an in-person teacher, how delightful! Yes...it is divine! The locations, food, culture...are wonderful beyond words. And it looks like I am going to have a great group, too! I can hardly wait till June! Love your bright banner! I spent three weeks in the south of France last summer. I keep wishing I had done some painting there, but sightseeing and photography were paramount. Wish I could return! Funny...I spend so much time sketching I miss out on other things. I know that when you travel with non-painters it is really hard to sketch. I hope you will get to return some day.